Rua Tipoki started an emotional rugby reunion with some of his old mates flanked by Irish staunch support -- and ended it on crutches with a tear in his eye. 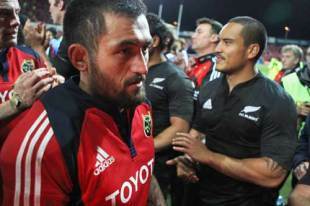 Tipoki was both a defiant and disheartened figure at Thomond Park Stadium here last night after the All Blacks prevented a repeat of their memorable loss to Munster 30 years ago with a tense 18-16 victory. The former New Zealand Maori captain -- who famously led a rousing mini haka by Munster's four players with Kiwi connections before kick-off -- had to watch Joe Rokocoko's dramatic 76th minute winner from the sidelines after wrenching a knee. Tipoki's retreat in the 52nd minute after he was tackled by former Maori and Crusaders teammate Corey Flynn was keenly felt by the Munster faithful. So was his impact before the game when he, Doug Howlett, Lifeimi Mafi and Jeremy Manning fired up an already feverish crowd by laying down a pre-match challenge to the All Blacks. The quartet stepped forward from their teammates and started a rendition of Ka Mate, the words drowned out by a wall of sound. The All Blacks stood stoic in their formation before also performing the team's standard haka in response, the mutual show of admiration setting the scene for an emotionally charged clash that Tipoki later described as a highlight of his career. "It's a special moment in my career, I'll always remember it," the midfielder said. "It was a once in a lifetime opportunity I suppose. As a Kiwi boy you're dreaming as soon as you can pick up a rugby ball that you're going to play for the All Blacks and as a Maori do the haka for the All Blacks..."
It did not quite work out that way for Tipoki, but last night was a more than adequate alternative. Howlett suggested last week the expat New Zealanders may perform a haka, though Tipoki said they were initially concerned about how the gesture would be received by the Munster faithful, past players and current teammates. "We were wary because we know Munster's already got such a rich culture and tradition," he said. "We didn't want to come here, place our stamp here and have people that have supported Munster for years... lived Munster and played for Munster say `Hey, what are these guys doing'?" After consulting management and former players, Tipoki decided to go ahead. "Everyone we spoke to wanted us to do it, we did it on behalf our team, they supported us and so did everyone who's been before us." Munster captain Mick O'Driscoll said there was no doubt the haka was appropriate. "It's something they wanted to do, we all rolled in behind them," he said. "I think it was a very proud occasion for them to be able to do that and we were over the moon to be part of it." Tipoki realised in an instant the crowd of 26,000 was also on his side. "They just went ballistic -- Mafi missed the start, the adrenaline just pumped you know." While Tipoki, Howlett and former Taranaki midfielder Mafi were expected to do the haka, Manning was the odd man out. Named on the reserves bench -- he eventually replaced Tipoki -- the 23-year-old played his early rugby in Marlborough before heading to Cork for tertiary study. Of the New Zealand contingent, he has been in the province the longest though Howlett, Tipoki and Mafi have all clearly been adopted. "I'm just so proud to be a Munsterman, even before today," said Tipoki, who joined the Heineken Cup champions from North Harbour in 2007. "Obviously we had a lot of players (10) missing (on test duty) but we said before we went on the field we wouldn't trade places with anyone. We were going out to be soldiers for each other, brothers, no matter what happened we were going to go to the wall for each other."